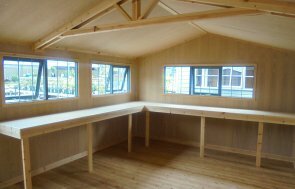 This stunning and functional 3.0 x 4.2m Superior Shed was recently installed for a customer based in Red Cross, Cambridgeshire who desired to have a custom overhang. Despite the height of the building being restricted to 2.5m for planning permission reasons, the internal height remains at a workable height of 2 metres thanks to the apex roof. There are also 5 fixed windows meaning that an abundance of natural light is able to flood the interior. 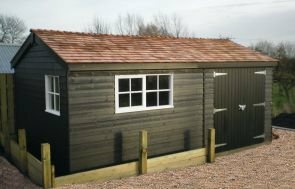 Externally, the shed boasts smooth shiplap cladding coated in our popular opaque paint shade of Lizard, which is not only water resistant and flake-free, but it also protects against fungi and woodworm. The roof is covered with our heat-bonded, heavy-duty felt which will protect against the harsher elements and also look attractive. The roof continues on one side of the shed to provide a 0.5m overhang which could be intended as a shelter for storing bins, barbequing equipment or other outdoor items. 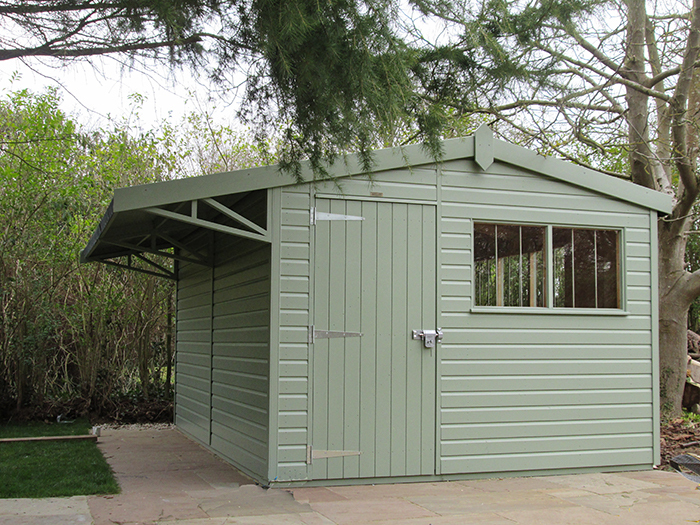 In order to browse our extensive collection of Garden Sheds, you can visit our webpage here. Alternatively, you may prefer to pay us a visit at one of our showsites or get in touch to speak to one of our friendly advisors.